The Embraer Legacy 600 is a business jet derivative of the Embraer ERJ 145 family of commercial private jets. The Legacy is based on the shortened ERJ 135 model, but includes added range with extra fuel tanks and added winglets, similar to those on the ERJ 145XR. As of recently, the Legacy family also includes the Legacy Shuttle, which applies the range of the Legacy to a passenger cabin configuration similar to the ERJ 135. 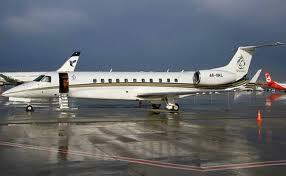 It is one of the larger jets many operators have for charter.